Established in Méribel since 1983, our Chalet is furnished in a traditional ‘Savoyard’ style and situated in the valley’s prime location. 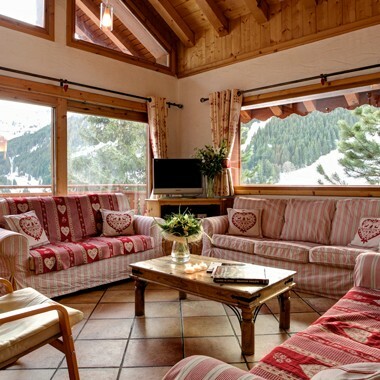 The chalet is equipped with a Hot Tub, UK Satellite TV, WIFI and a Bose sound system. Book your Meribel Skiing holiday with ‘Ski Out of the Blue’ and start planning your next adventure now. Sleeps up to 14 wih 7 en-suite bedrooms. See what the Méribel resort has to offer you on your next Skiing holiday as well as check the weather live. See our perfect location, just 100 metres from the town centre and right on the slopes. What makes us so unique is our passion for food, ensuring your stay is truly unforgettable. I just wanted to drop you a quick email to say thank you for such a fantastic time, Chalet Tapia is perfect, the Chef was amazing (I'm amazed he managed to cook such fantastic food in a normal kitchen!) and Petronella, the host, is worth her weight in gold!